The Semaphore Code, which is a development of the old land "telegraph" lines, is limited to visual signaling, and over comparatively short distance. It is, however, the fastest method of flag signaling, and is an important companion code for wigwag. It has been a traditional code in the Coast Guard, the Army, and the Navy. It was in this latter branch of the service that it reached its highest point of development because of its rapidity and simplicity in the exchange of messages between ships of the fleet when they were in close formation. 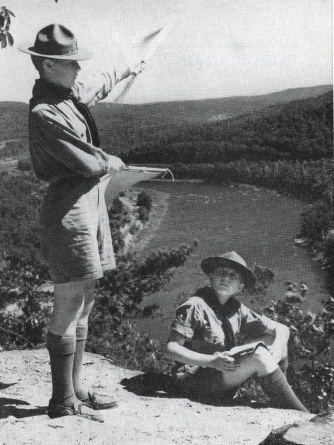 Signalman Sam's Semphore Flag Code course utilizes Signalman Sam, an automated Semaphore training aid based on drawings in the 1940 edition of the BSA Signaling merit badge pamphlet. This course divides the alphabet into six letter groups and uses Signalman Sam to send the individual letters in each group as well as words and messages made up of only the letters in the groups you have already seen. After you are comfortable with receiving each message, use the BACK button on your browser to return to this course page. As you progress through the six letter groups you will learn the entire Semaphore Code. You can change the speed at which Signalman Sam sends his message, and you can have Sam send the same message again as many times as you wish. For more of a challenge, speed him up. To make receiving easier, slow him down. At the very beginning you may wish to turn on the display of each letter as Sam sends it. If Sam has not displayed each letter as he sends it, the complete message will appear after he finishes sending, and you can check what you received. For an even greater challenge, use Sam's ability to send the letters of his message backward or even in random order. For still more of a challenge you can have Sam surrounded by fog! The best way to make progress learning a code is by regular, steady practice. Keep track of your progress through this course and you should quickly become a proficient receiver. Just a short session every day should let you make good, rapid progress. Don't forget to practice sending, too. Signalman Sam was implemented by Boy Scout Troop 52, Cranbury, New Jersey. This Semaphore Flag Code Course was also implemented by Troop 52. The extreme range of the 18-inch flags with the naked eye is not more than a mile under perfect conditions, but this distance may be increased by the use of a telescope of field glasses. Just as in wigwag, the visibility is dependent on the light and weather conditions and on the background. A Semaphore signalman should select his background is exactly the same manner as a wigwag background is chosen. From the very beginning learn to make your signals distinct. The flag must become a rigid extension of your arm, and not be allowed to move sloppily. Never make your receiver guess the exact position of your flag. Your arm might be held in the 9 o'clock position, but with the flag jutting out at an additional angle, it might well be read as the 10:30 position. Start slowly with the emphasis on distinctness. If possible, practice continually with another Scout in the same stage of development as yourself, so that your receiving ability will progress at the same rate as your ability to send. Remember - "It is much easier to Send that to Receive!" Always move crisply from one position to the next, with a definite pause when the new letter is made. The "Interval" sign is used by Scouts to indicate the end of a word. It may be held slightly longer than a letter. Two intervals indicate the end of a sentence, and three intervals in succession, the end of a message. However, it is well for you to know that the Navy and some other signal units use the so-called "chop-chop" in place of the interval sign. The chop-chop is made by holding the flags together at either a right or left horizontal, and chopping them up and down twice. One chop-chop indicates the end of a sentence, and two chop-chops, after which the flags are withdrawn from view, indicate the end of the message. Use the "Attention" sign at the beginning of a message to let the receiver know you are ready to begin sending. The "Numeric" sign is discussed below. Semaphore Code is, of course, a visual method of signaling. When you are receiving you must keep your eye on the sender. This makes it more difficult to write out the message you are receiving than it would be with a sonic method of signaling such as Morse Code sent with tones. Using a team of signalmen is helpful when dealing with long, important, complex messages. 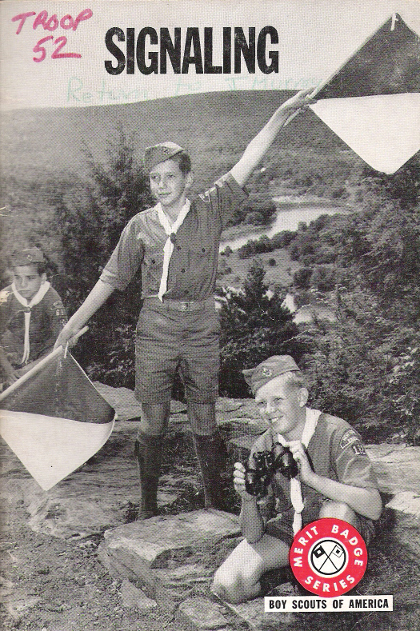 The pictures below, taken from the 1940 and 1960 editions of the BSA Signaling Merit Badge pamphlet, show Semaphore signaling teams. The 1940 Semaphore team, on the left, has a sender/receiver (flagman) and a scribe (recorder). When receiving, the flagman calls out each letter of the message and the scribe records it. When sending written messages the scribe calls them out and the flagman signals them. The 1960 Semaphore team, on the right, is signaling over a greater distance, such that they need to use field glasses (binoculars) to see clearly the messages they are receiving. So the 1960 team includes a flagman, an observer, and a scribe (recorder). (Yes, the flag in the sender's right hand is mounted upside down. Did you catch that?) If you need to deliver messages to or retrieve them from the Troop while the signal point is manned, you can add a messenger to your Semaphore team. If you realize (or your scribe points out) that you have made an error while sending a message, send the "Attention" sign. Then start the current word over again. If you are receiving a message and see the attention sign, ignore any letters that you have received since the last "Interval" sign (or since the beginning of the message if you have not yet received an "Interval"). Numerals are formed by first making the "Numeric" sign, and then using the first ten letter of the alphabet as in the table below. Here again it is well for you to know that the Navy does not use the "Numeric" sign. Navy signalmen always spell out any numbers ("ONE", "TWO") in their messages.